Legacy Habitat Management are a leading wildlife habitat management specialist and have over 20 years experience in all aspects of this sector. Experience that focuses on wildlife mitigation, all types of fencing, conservation management, wildlife habitat installations and public access. Legacy Habitat Management have many years experience and specialise in wildlife fencing for protected species mitigation projects and controlling wildlife movements. Having worked on projects all over the UK and on a whole range of site environments has helped to confirm our reputation as a leading UK wildlife fencing contractor. We have the equipment, machinery and a highly skilled workforce that can tackle any vegetation site clearance project in a range of environments on both brown field and green field sites. We have worked with a number of high profile clients including works on power stations, railway trackside and for many large development contractors. Having a background in ecological contracting works, Legacy Habitat Management carry out all works with a sensitive approach to all flora and fauna. We work closely with conservationists, ecologists, land managers and developers in both the public and private sectors, achieving targets and goals within the most demanding of Conservation Management plans. Liaising with clients on all aspects of design detail, costings, through to construction and installation on site ensures that our work meets the required specifications and is completed in an ecologically sensitive manner. We have many years of experience in the creation of ponds and wetlands. These provide crucial habitat and breeding/feeding grounds for many species of amphibians, insect and plant species. We operate a wide range of specialist fencing equipment that enables us to install large contract fencing efficiently and quickly. Using our Unimog and Quickfencer allows us to access most terrains and construct large quantities of stock fencing, demarcation fencing and other fencing systems, making us the ideal choice of contractor for pipeline fencing projects. Our skilled fencing team are experienced in working in all types of environment from development sites, agricultural land and brownfield sites to remote locations and SSSI's, and understand the sensitive nature of working in such locations where care must be exercised towards flora and fauna. Wildlife Fencing is the first dedicated online retailer for wildlife mitigation products and wildlife fencing materials. We can provide all the materials for your newt fencing, badger fencing, water vole fencing projects and other fencing materials, now including electric fencing, in wholesale or smaller quantities. The Caudon® Badger Gate has been developed to provide the toughest, most effective and versatile badger gate available on the market. The all galvanised steel construction will resist the most determined of badgers, creatures that are known to be notoriously destructive. Our experience has shown that wooden badgers gates are easily destroyed by badgers, rendering them ineffective. The durable nature of the Caudon® badger gate also means that it can be used many times for different projects. The Caudon® badger gate consists of a galvanised steel frame with pointed side legs and a strong box section top bar to enable them to be hammered into the ground. A two-way swinging gate provides the access aperture for the badgers. This comes with a ‘lock-down’ bar that enables the gate to be fixed in a one-way position, or totally fixed so that it doesn’t open in either direction. 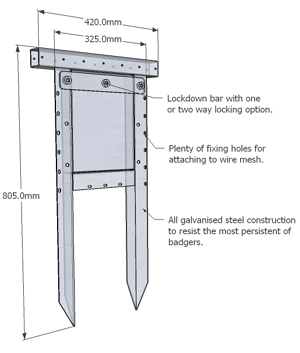 The Caudon badger gate frame includes a large number of pre-drilled fixing holes, this allows for the easy fixing of badger netting, or badger-proof ground coverings.